A letter from William E. Johnson to Dennis Holcomb, dated July7, 1981. 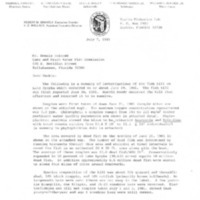 Enclosed with the letter is a report by Johnson, a biologist with the Florida Game and Fresh Water Fish Commission (GFC) regarding a fish kill in Lake Apopka that occurred in June of 1981. The report states that the fish kill was first reported on June 20, and described as "massive" by Holcomb, who was also a fisheries biologist with the GFC. Sample counts of areas of the fish kill estimate that the fish kill totaled 18 million fish, primarily gizzard and threadfin shad. The report also states that no largemouth bass were present in the kill, and it is assumed that none are present in the lake at the time of writing. 15-20 Sunshine bass were observed. Sunshine bass are a hybrid bass used to artificially stock lakes, and Lake Apopka was stocked with Sunshine bass fingerlings in May of 1981. The report concludes, based on water samples, that the fish kill was a result of oxygen depletion after a period of above-average temperatures and stormy weather conditions. Water quality data from the samples are also attached. Original 8-page typewritten letter from William E. Johnson to Dennis Holcomb, July7, 1981: binder 1981, Friends of Lake Apopka Archives, Ginn Museum, Oakland Nature Preserve, Oakland, Florida. Digital reproduction of original 8-page typewritten letter from William E. Johnson to Dennis Holcomb, July7, 1981. Originally created by William E. Johnson. This resource is provided here by RICHES of Central Florida for educational purposes only. For more information on copyright, please refer to Secton 24 of the Florida Constitution. Johnson, William E.. “Letter from William E. Johnson to Dennis Holcomb (July7, 1981).” RICHES of Central Florida accessed April 22, 2019, https://richesmi.cah.ucf.edu/omeka/items/show/7966.